Today was one of those days when I needed to be all sentimental about the boys. I love being their mama and even though I get stressed out sometimes (who doesn’t?) there is nothing I would rather do than show them that I love them with my whole heart. I read a very sweet post about the passage of time from a mother whose own children are now heading off to college and it was so bittersweet. Mostly sweet, but a real reminder of how quickly time passes. Yes these days can be long but the years are so very very short. My post over on BabyCenter today was inspired by this notion. 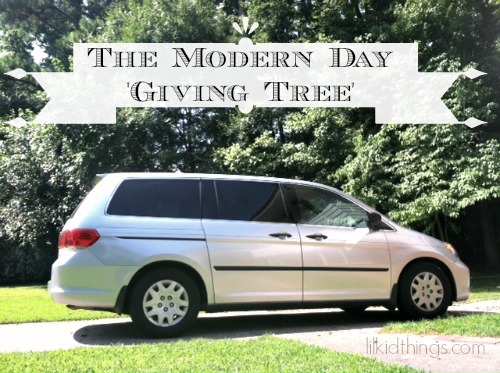 If you need a good sigh or even a good cry, head over to Is the minivan the modern day ‘Giving Tree’?